Emily's dad has been business partners with the mornings as long as Emily could remember. she has always been close to chase mornings, he was her first kiss after all and he was her first love. Emily's always been able to go to chase with everything. now hes her maths teacher always there looking over her shoulder making sure she can't do anything. to make matters worse now Emily has to move in with him and she also has to marry him. she doesn't know how it is going to work. 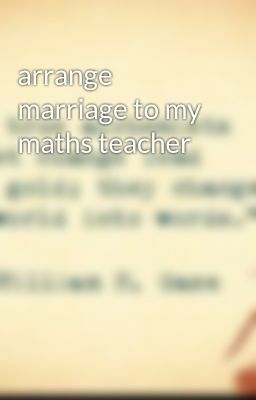 chase has just finished college and has started his new job as a maths teacher at the school were the most important person is attending he knows that Emily doesn't understand why that he is this way to make sure shes safe at school.